Make sauce. In a large pot over medium high heat, saute onions and garlic in olive oil until softened. Add remaining ingredients, lower heat and simmer slowly, stirring occasionally for an hour. *I doubled the sauce for a large crowd. Make filling. Combine all cheeses, egg, and seasoning in a large mixing bowl. Add spinach and artichoke hearts and mix to blend. Boil shells for two minutes less than package directions and drain. They will be easier to stuff if they are not fully cooked. Lots of people probably have genius ways to stuff the pasta shells, but I like to do it with my hands, messy, but less chance of splitting the shells. 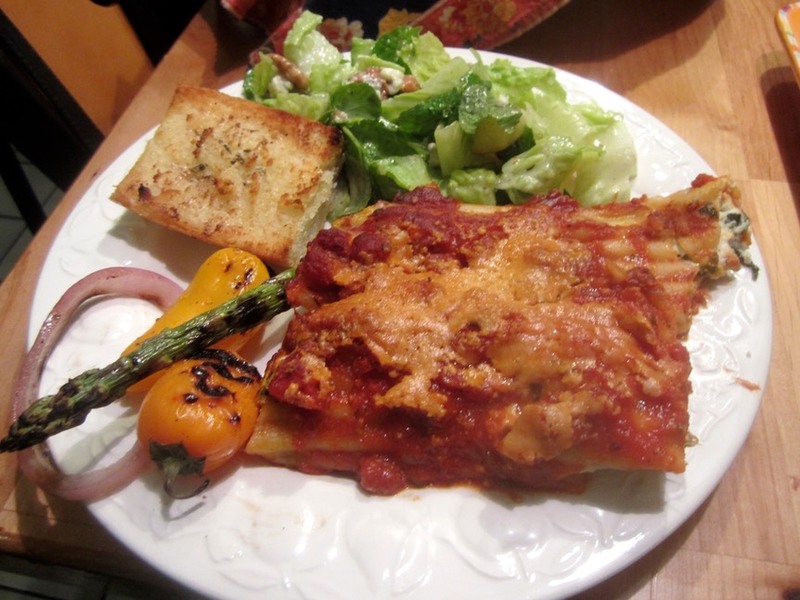 Layer sauce with stuffed shells and more sauce. Top with a sprinkle of Parmesan cheese. This can be refrigerated until ready to bake. Preheat oven to 350 degrees and bake for about 45 minutes until bubbling and browned on top. **Use leftover spinach, artichokes, and cream cheese to make a dip. Add Parmesan cheese, garlic salt and a healthy splash of sherry. Bake until heated through and serve with your favorite crackers!